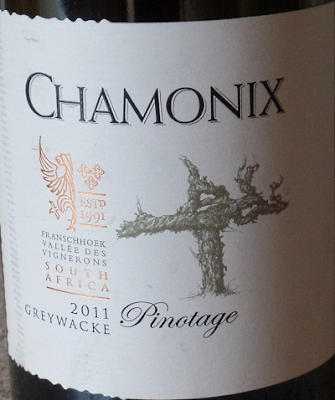 My Wine of the Month for July is Chamonix Greywacke Pinotage 2011. The 2.5 hectare vineyard at 350 metres altitude is planted on Greywacke (grey-wacky) soil, a grey sandstone with a high clay content and plenty of coarse-grained particles giving stony, free-draining soils. This wine undergoes two fermentations; a carbonic maceration in stainless steel is followed by a second fermentation when partially dried grapes are added in a similar way to the Italian ripasso method. Then after malolactic fermentation the wine is matured for 18 months in 228ℓ French oak barrels. 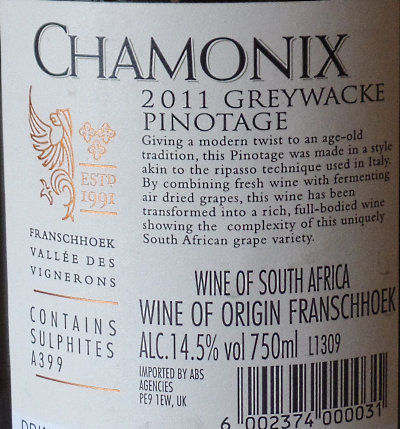 On the palate the wine feels very smooth with oodles of sweet fruit developing into a spicy mid-palate, balanced by a slight tartness with a raisiny thread. Definitely a serious food wine.